It begins, as the best superhero stories do, with a tragic accident that has unexpected consequences. The squirrel never saw the vacuum cleaner coming, but self-described cynic Flora Belle Buckman, who has read every issue of the comic book Terrible Things Can Happen to You!, is just the right person to step in and save him. What neither can predict is that Ulysses (the squirrel) has been born anew, with powers of strength, flight, and misspelled poetry — and that Flora will be changed too, as she discovers the possibility of hope and the promise of a capacious heart. From #1 New York Times best-selling author Kate DiCamillo comes a laugh-out-loud story filled with eccentric, endearing characters and featuring an exciting new format — a novel interspersed with comic-style graphic sequences and full-page illustrations, all rendered in black-and-white by up-and-coming artist K. G. Campbell. Kate DiCamillo is the author of many beloved books for young readers, including The Tale of Despereaux, which received a Newbery Medal; Because of Winn-Dixie, which received a Newbery Honor; The Tiger Rising, a National Book Award Finalist; The Miraculous Journey of Edward Tulane, winner of a Boston Globe–Horn Book Award; The Magician’s Elephant; and the best-selling Mercy Watson series. Kate DiCamillo lives in Minneapolis. K. G. Campbell is the author-illustrator of Lester’s Dreadful Sweaters. He was born in Kenya, raised in Scotland, and now lives in southern California. In "Flora and Ulysses," longtime fans will find a happy marriage of Mercy Watson's warmth and wackiness and Edward Tulane's gentle life lessons. In Flora, they will find a girl worth knowing, and one they will remember. Newbery-winner DiCamillo is a master storyteller not just because she creates characters who dance off the pages and plots, whether epic or small, that never fail to engage and delight readers. Her biggest strength is exposing the truths that open and heal the human heart. She believes in possibilities and forgiveness and teaches her audience that the salt of life can be cut with the right measure of love. Original, touching and oh-so-funny tale starring an endearingly implausible superhero and a not-so-cynical girl. Despite supremely quirky characters and dialogue worthy of an SAT prep class, there’s real emotion at the heart of this story involving two kids who have been failed by the most important people in their lives: their parents. Rife with marvelously rich vocabulary reminiscent of the early superhero era (e.g., “Holy unanticipated occurrences!”) and amusing glimpses at the world from the point of view of Ulysses the supersquirrel, this book will appeal to a broad audience of sophisticated readers. There are plenty of action sequences, but the novel primarily dwells in the realm of sensitive, hopeful, and quietly philosophical literature. Masterfully mixed with adventure, mystery, and laughs, this title could be used as an entertaining class read-aloud. Beneath the basic superhero-squirrel-friend plot, DiCamillo imbues this novel with emotion by focusing on larger life issues such as loss and abandonment, acceptance of difference, loneliness, love, overcoming fears, and the complexity of relationships. She also adds plenty of warmth and humor throughout... This little girl and squirrel and their heartwarming tale could melt even the most hardened archnemesis’s heart. Eccentric characters, snappy prose and the fantastical plot give this delightful novel a giddy, over-the-top patina, but the core is big and hopeful, contemplative and bursting with heart. No small feat, even for a superhero like DiCamillo. Helped in no small part by K.C. Campbell’s perfectly placed illustrations, Flora and Ulysses does precisely what I always want in a book. It lures you in with the ridiculous and then when you least expect it gets you in the gut with a bolt of pure, uncut, unadulterated meaning. Rare fare. ... Exceptional. Full of Ms. DiCamillo's dry, literate wit and bursting every so often into action-packed comic-strip sequences illustrated by K.G. Campbell... [a] funny, eccentric novel. The incomparable Kate DiCamillo, creator of “The Miraculous Adventures of Edward Tulane” and “The Tale of Despereaux,” has outdone herself in this extraordinary tale of love, connection, healing and finding your way home, themes that run through all of her work. ... DiCamillo is laugh-out-loud hilarious... while delivering lovely asides and beautiful insights about the human condition and the importance of being open to the mystery of the everyday. [L]augh-out-loud funny, tender, difficult and hopeful all at once. ... Cynics beware, this book is meant for those open to joy, wonder, loyalty and friendship of all stripes. Kate DiCamillo is a fine storyteller who respects her readers with rich and sophisticated language that touches the mind and tongue like delicate spice. ... Shaded pencil sketches propel the action and provide additional clues to characters and setting into a story of humor and joy tinged with sadness and unconditional love. Beautifully written... The accompanying illustrations and cartoons are enchanting, and the remarkable DiCamillo demonstrates she has storytelling power to spare. With her signature wit and wisdom, DiCamillo captures readers' hearts in this slightly outrageous and thoroughly enjoyable tale. [A]n offbeat concoction... [T]he writing is sharp, with a lexicon of SAT-level words and a core belief in possibilities - hope, love and happiness. Kate DiCamillo's newest book ... is that rarest of all treasures, a truly inventive and appealing children's middle-grade novel. [A] fast-paced, funny tale. 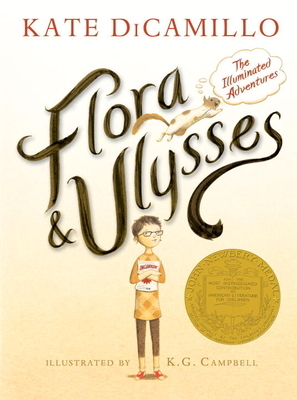 ... Like all of DiCamillo's books, Flora & Ulysses is filled with adventure, but also plenty of humor and soul. ... DiCamillo has seamlessly blended comic-book elements and a zany cast of characters into a thoroughly original, heartwarming tale. This is a fun and clever tale of an unlikely hero uniting an even more unlikely cast of characters. Kate DiCamillo strikes again. Each character is well-drawn, the story is packed with fun references and asides. It's a perfect blend of poignancy and magic. DiCamillo does here what she does best, which is tell a deceptively simple story that elucidates big truths. ... And though the ideas are sophisticated, the storytelling is engaging enough to lure in a reader who might be put off by a doorstop of a novel. This slim volume also features illustrations by K.G. Campbell... [which] jell seamlessly with DiCamillo's prose. Though their adventures are wild and wacky, the heart of the story is about a girl adrift and how she finds her way home. Pencil illustrations and comic book panels by K.G. Campbell complement Kate DiCamillo's text perfectly. After reading Flora and Ulysses, you'll be asking when the next installment is due. Much like its furry hero, this swiftly paced tale is full of bold leaps and surprising turns. ... K.G. Campbell’s occasional drawings supplement the narrative and brilliantly interpret the characters, from the partially bald Ulysses to chain-smoking Mom. As with her previous big-hearted novels, DiCamillo proves once again that “astonishments are hidden inside the most mundane being,” and gives us another fantastic story. Brilliantly written and graphically engaging, it’s filled with adventure, poetry, and compassion. Worth reading, and equally appealing for kids and adults.